Today I’m sharing with you all my homemade artisan bread recipe. I’ve tried many bread recipe’s over the years, but always come back to this one. It has a great crust and the inside has those holes and crevices for a wonderful airy loaf with great texture. Making artisan bread at home is easy and doesn’t take very long either. I start the bread the afternoon before I want to bake it and in the morning I can bake the bread and fill the house with the lovely aroma of homemade bread. Time to bake some homemade artisan bread! Start with a large bowl and combine all the dry ingredients and whisk to combine. Pour in the water and stir. You may need to add water depending on the temperature and humidity of your home. 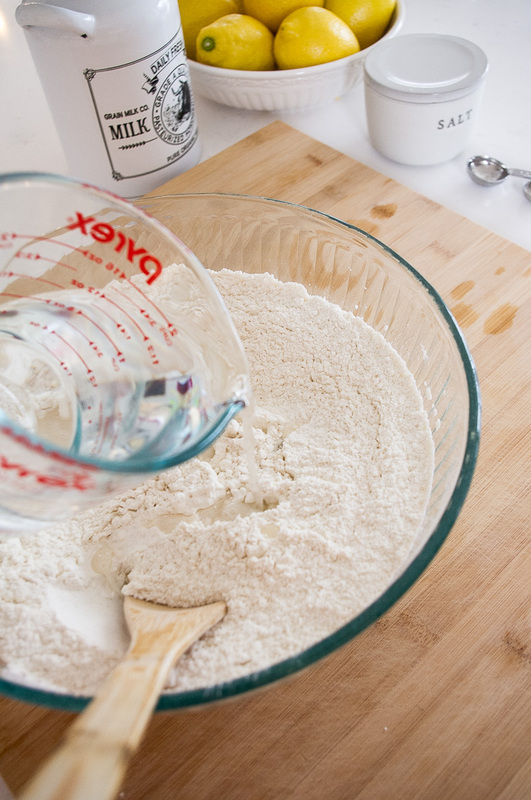 If your dough seems dry, just add the water 1 tablespoon at a time until the dough is wet and sticky. As a result, it should be kinda messy to work with. 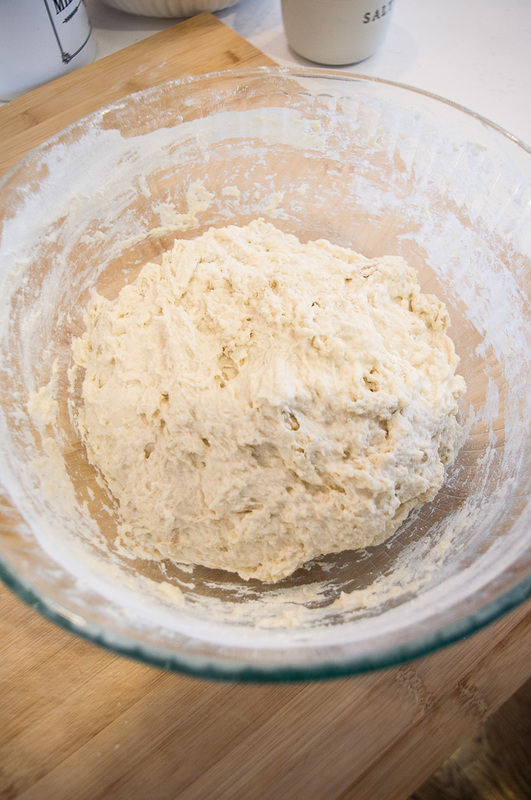 Once your dough is ready, cover the bowl with plastic wrap and set on your countertop to rise overnight or for 12 – 18 hours. This long rise helps in the fermentation of the yeast, which gives you a more flavorful loaf of bread. What!? 12 – 18 hours! Yes. I usually start my bread in the afternoon and then the morning of the next day bake my bread. Also, this bread does not require any kneading and therefore doesn’t take much effort, so you can produce a delicious loaf with very little “hands-on” time. The dough is ready when it is covered in small bubbles and smells “yeasty” (not sure if that is a word) and it has filled the bowl. At this point, you’ll want to flour your hands really well and start pulling the bread away from the side of the bowl. It will be sticky, but I just keep the flour close and keep my hands floured. 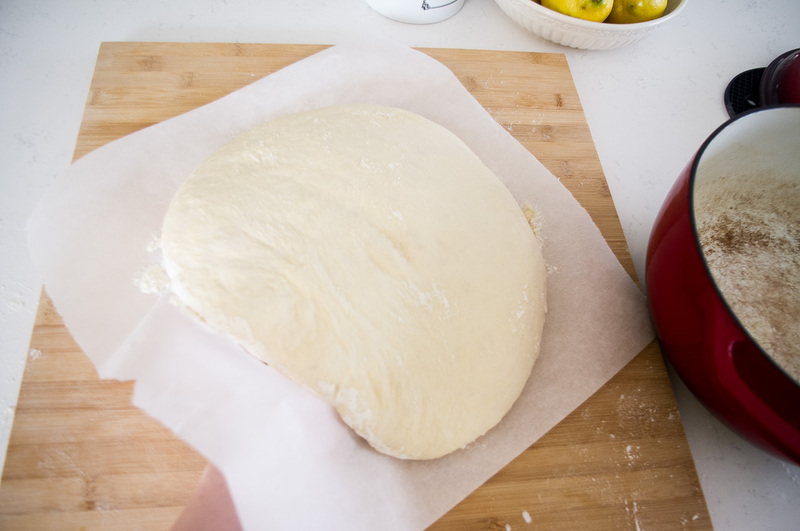 Dump the dough onto a piece of parchment paper, this is going to help when we turn the bread into our dutch oven. 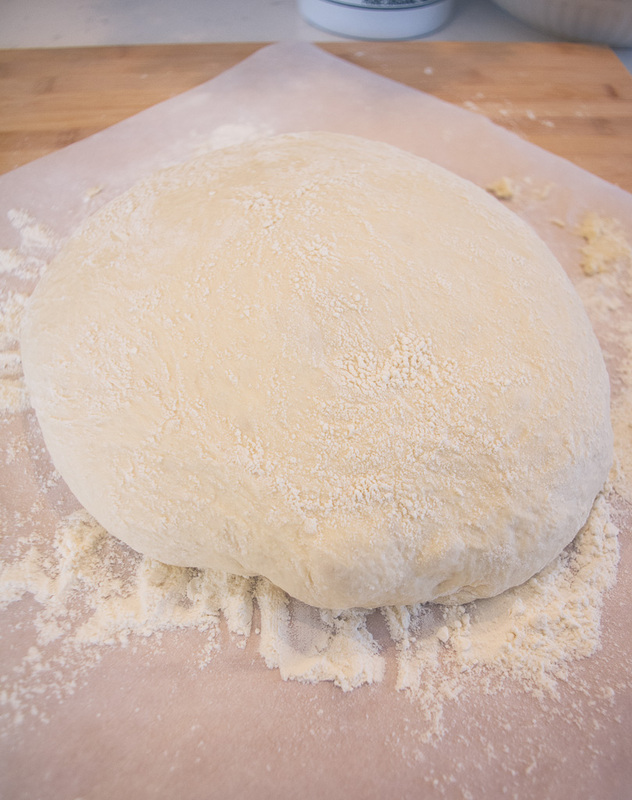 We want to tuck the dough into a nice round shape. The more “rustic” (read not perfect) the better it will be. 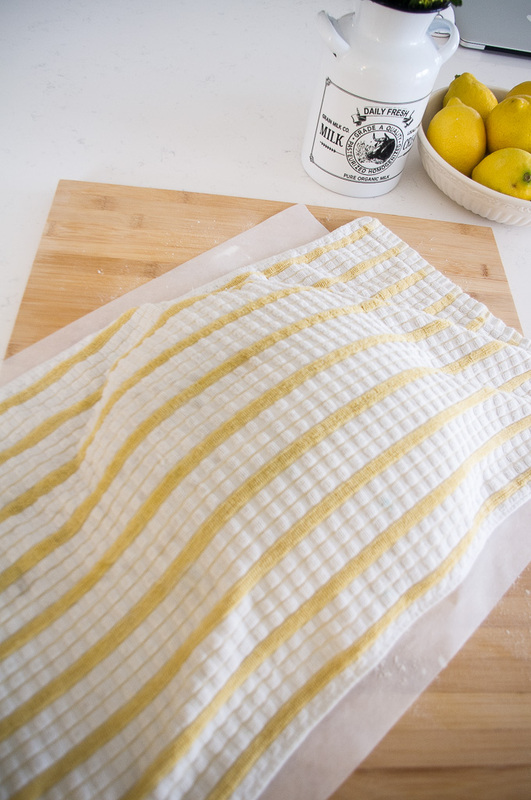 Sprinkle a cotton tea towel with some flour and place on top. Allow the bread to rest for 1-2 hours. 30 minutes before the rise time is over add your dutch oven to a cold oven and set to 425 degrees. 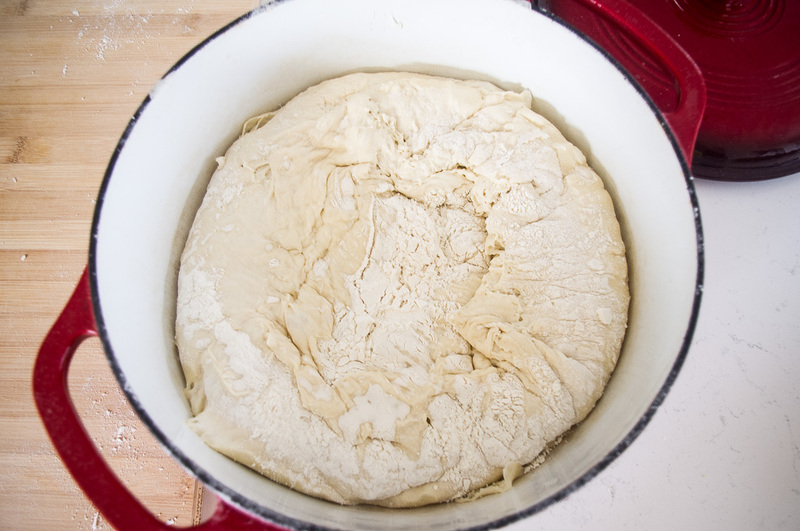 After the oven has come up to temperature, remove your dutch oven and place next to your dough. Remove the tea towel. Slide your hand under the parchment paper and dump the bread seam side up into the dutch oven. Again it’s ok if it’s not perfect. Also, the closer your bread is to your pot, the less flour you’ll have flying all over your kitchen. Next, remove the parchment paper and place the top back on your dutch oven, and place in the oven. Bake for 40-50 minutes. Remove lid and bake for additional 5-10 minutes, until the crust has developed a nice golden brown color. Remove from the oven, the temperature of the bread should be around 200 degrees. Next, remove the bread from the pot and place on a cooling rack, allow to cool until the bread is at room temperature (~2 hours). If you cut the bread to soon it will turn gummy and dense. Yuck. Congrats! You just baked your own artisan bread at home. Your house will smell amazing at this point! We love this homemade artisan bread alongside a bowl of soup, made into a grilled cheese (our favorite) and of course with some butter. 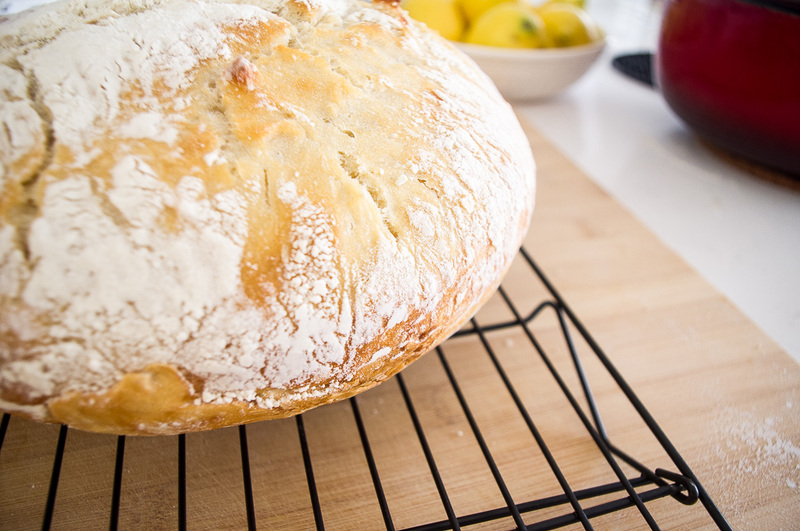 Soft and airy homemade no-knead artisan bread! 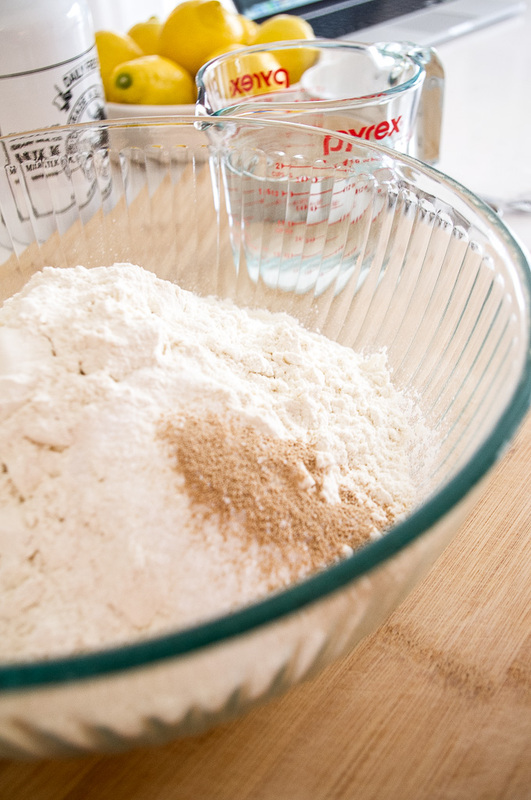 In a large bowl combine the flour, yeast, and salt. Add the water and stir until all the ingredients are well incorporated; the dough should be wet and sticky. Let the dough rest 12-18 hours, or overnight, on the counter at room temperature. 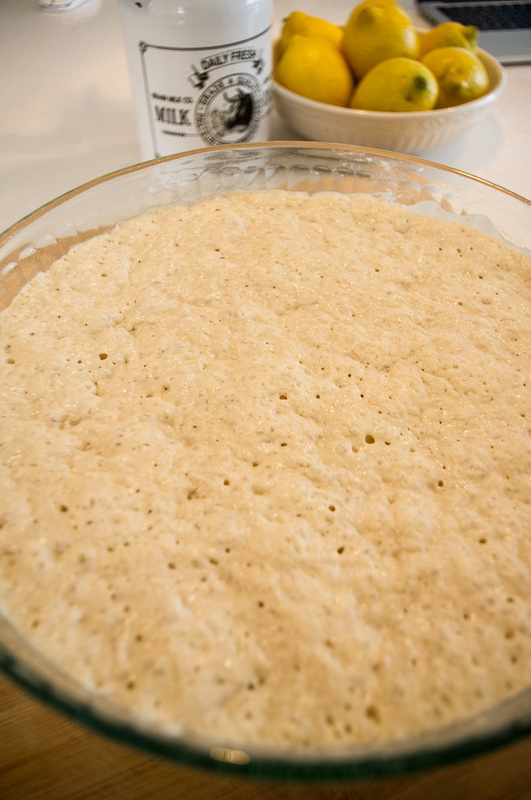 When the surface of the risen dough has darkened a little, smells yeasty, and is dotted with bubbles, it is ready. Lightly flour your hands and work surface. 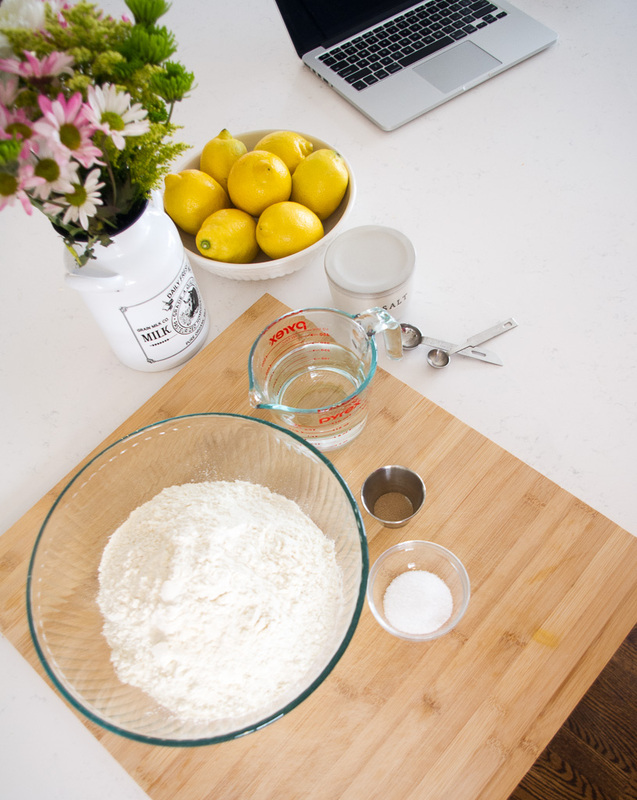 Place dough onto your work surface and sprinkle with more flour. 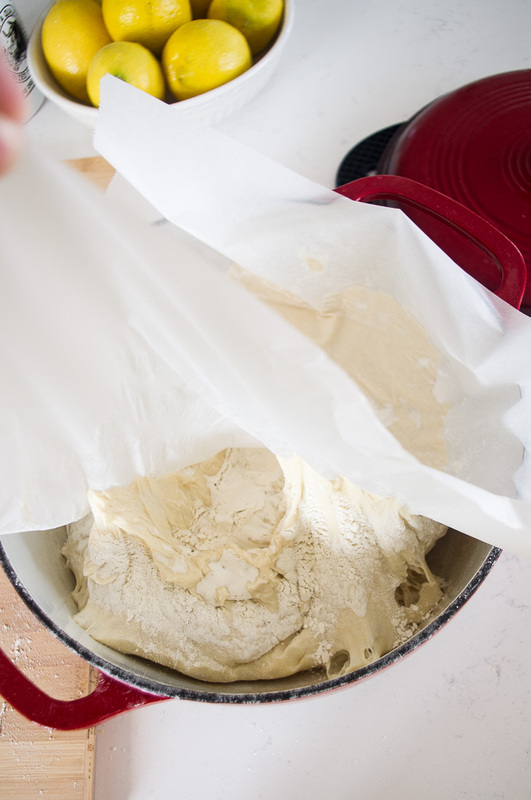 Fold the dough over on itself once or twice and, using floured fingers, tuck the dough underneath to form a rough ball. 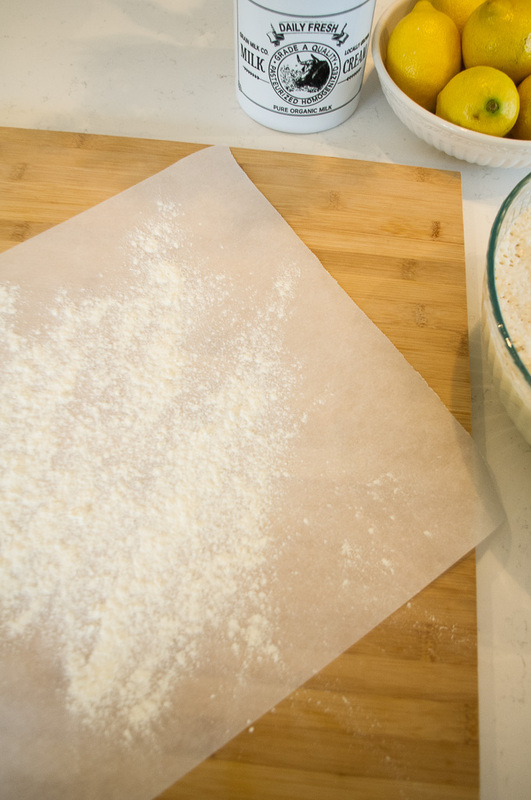 Place a full sheet/large rectangle of parchment paper on a cotton towel and dust it with enough flour, cornmeal, or wheat bran to prevent the dough from sticking to the parchment paper as it rises; place dough seam side down on the parchment paper and dust with more flour, cornmeal, or wheat bran. Cover with a cotton towel. Let the dough rise for about 2 hours until it has doubled in size. 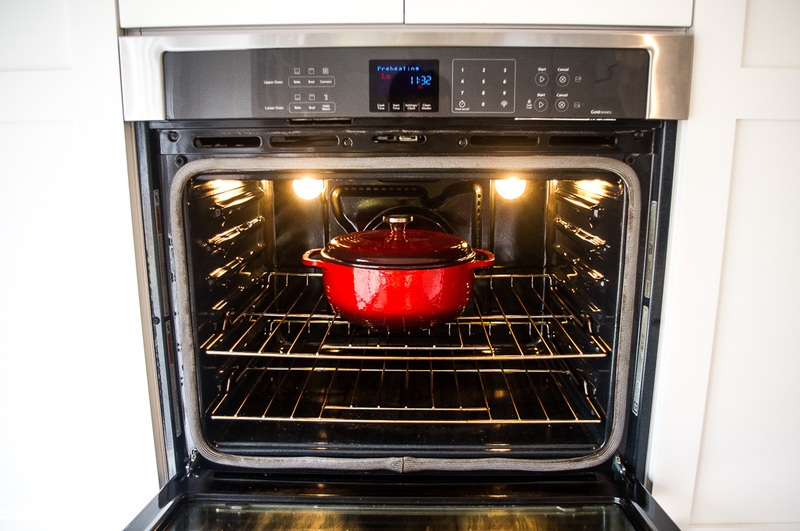 After about 1 1/2 hours, preheat your oven to 425 degrees and place a 6-8 quart heavy bottomed pot, such as a cast-iron Dutch oven, in the oven as it heats with the cover on. When the dough has fully risen, carefully remove the pot from oven. Unwrap the towel and parchment paper from around the dough and slide your hand under the bottom of the dough ball; flip the dough over into the pot, seam side up. Pull the parchment paper off, scraping any stuck dough into the pan. Shake pan once or twice if the dough looks unevenly distributed; it will straighten out as it bakes. Cover and bake for 40 minutes. Uncover and continue baking for 10-15 more minutes, until the crust is a deep chestnut brown. 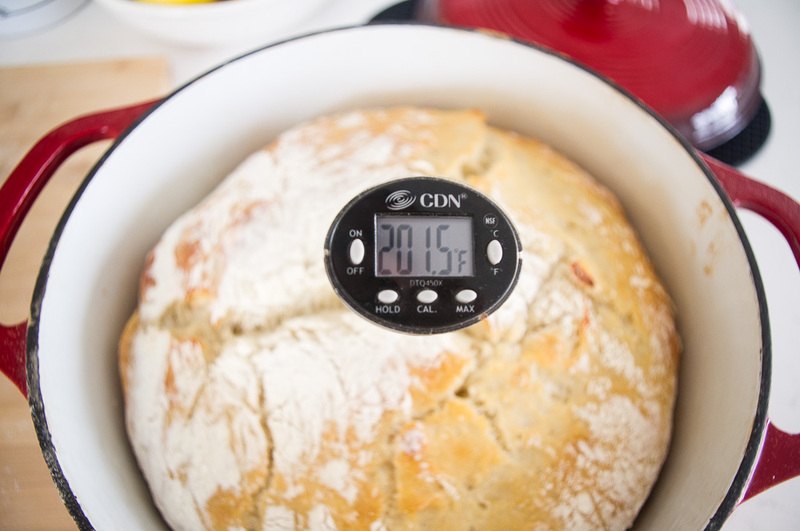 The internal temperature of the bread should be around 200 degrees. You can check this with a meat thermometer if desired.